If you are traveling in the realm of arts education today, you will likely hear reference to Habits of Mind. This is a good term to familiarize yourself with if you are interested in advocating for the arts in education. Even the Obamas use it. The term, I mean. Last year Obama’s Committee on the Arts and the Humanities, of which Michele Obama is the Honorary Chair, released a report called Reinvesting in Arts Education: Winning America’s Future Through Creative Schools. It’s the first federal analysis of arts education data that has been done in more than a decade. Okay, but we’re not done yet! The first list sounds easier to digest with a school district agenda chaser, but personally, I prefer the second. How can you not love responding with wonderment and awe and humor? More people should do this. Now let’s take a look at some of these theories put into action locally. Arts Corps is an organization dedicated to the idea that “every child, regardless of financial ability, deserves the freedom to imagine and the courage to be.” By placing professional teaching artists at program partner sites throughout King County where youth are naturally present–schools, community centers and other youth-serving organizations–Arts Corps is able to provide broad access to arts learning. Since 2000 they have done an amazing amount of work to bring quality arts education to thousands of young people in our area. I highly recommend watching the video. It is inspirational and enlightening, and makes the case that the arts in education support the needs of the student, not just the needs of the system, and that that should be our priority. Well, thank heavens for that. Since one can’t be tested on skills like envisioning or metacognition, let’s keep it that way, and instead focus on these Habits of Mind and what we gain from them. Me, I’m going to persist in looking for the humorous and the awe-inspiring, in searching for problems we can solve, and then in risking telling you about it all. This entry was posted in Art and learning, Arts advocacy, Seattle Public Schools and tagged art and the brain, Arts advocacy, arts and learning, Arts Corps, arts in public schools, arts inclusion, arts liaison, habits of mind, Pebbles In The Jar. Bookmark the permalink. Excellent post, Margaret! I like the second list as well. Hale uses the first list a lot. I’d like to try to figure out how to incorporate both into my own teaching. If I know you, Julie, you already do incorporate a lot of these list items in your teaching. I imagine you doing so as part of your natural teaching style. These habits seem worthy of cultivation for adults as well as children. 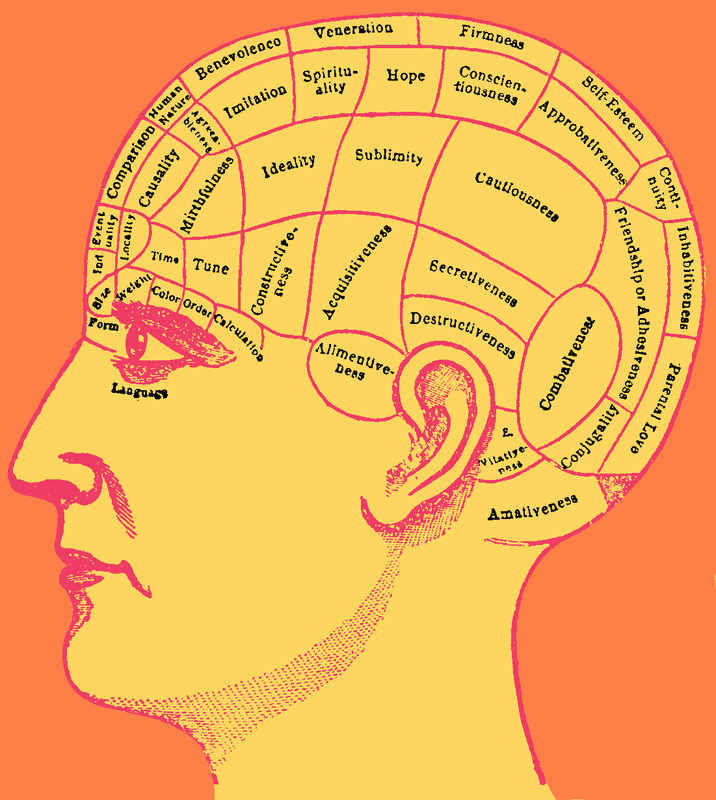 I did notice that the phrenology head in your illustration has a section for alimentiveness. That should surely be added to the list. How about olfactoriness? one of the best. BTW, I think there’s something to be said for rote learning. Mrs. Hiestand in third grade made us memorize a poem a week. I still remember many of them and it instilled a love of poetry very young. I also studied North Indian classical music for four years, and Tibetan meditation practice for 20 (whew! never counted before!). In any case, it all involved tons of memorization, which I think is way underrated. It’s a part of the brain that needs exercise, like all the others. It feels good, like a strong muscle. And what about lines in a play? You have a point there. I guess I was thinking of seventh grade when I had to memorize all the longitudes and latitudes of the capitols of Europe, and then gratefully un-remembered them after the test. There was a day when rote memorization was the benchmark of intellect. However, technology enables facts and figures to be ascertained in moments. Intelligence is now measured by what you do with what you know and success is very dependent upon creativity. Bill Gates, Jonathan Tweet, Dean Kamen are all examples of Habits of Mind thinkers. Thank you Margaret for bringing to the fore front of all our minds the continual need to support not just the arts in schools but the multiple ways the minds of the artist operates and then apply that to all aspects of education. And a shout-out to Art Corps for their dedication to all children! That’s very true, Judy. Rote memorization is still a valuable learning tool when it works as a pathway to further learning–as Ellen mentioned with theatre, as well as music, dance, the sciences–but not as a proof of learning in and of itself. And, I think your yarn-bombing project at Franklin practiced quite a few creative habits of mind! I teach 1st grade and have the pleasure of having older brothers and sisters who were past students of mine cluster around our door at dismissal so they can hear and often join in reciting the traditional poem we enjoy at 3:10- clearly there’s a place for memorization. As my 18yr old struggles with finals studying this week, I look at both lists and sigh..* Another edu buzzword, “lifelong learner” seems to sum up many of the habits, minus perhaps the creating bit. Wonderful post, Margaret! These have been my own personal feelings for a long time, and I try to put the principles into action with my college students, but in terms of what’s happening now in education for K-12, I’m worried. And I’m coming to this so late, with my kids grown and out of the house now. Too late? Well, there’s my grandson, who has a few of these Habits of Mind right now and he’s entering kindergarten in September. I sure don’t want him to lose touch with those habits as part of his “education.” Time to get busy, do a bit more myself. It’s a call to action – thanks for the nudge! Teachers aren’t the only ones that kids learn from, luckily. I see the two of you flaneuring together, Julie, creating some wonderful memories along with those habits of mind. Pingback: Educationally Speaking: Rote is Out - Thinking is In!